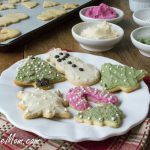 Sugar Free Sugar Cookies with a gluten free option! 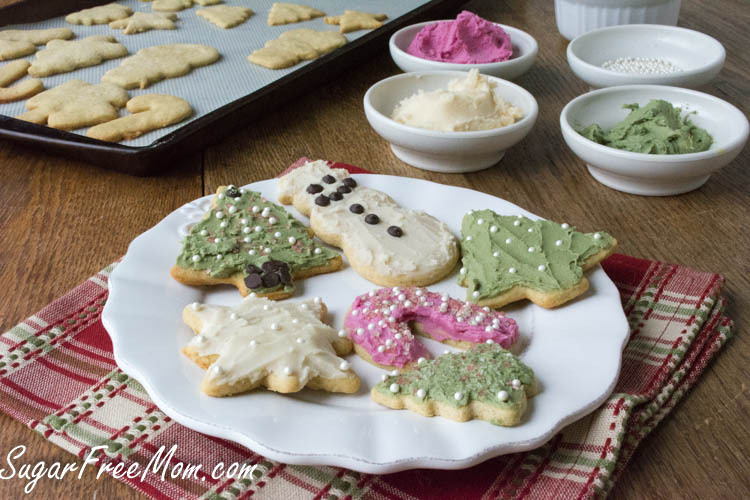 Who doesn’t love sugar cookies during the holidays? These are made without sugar and you can use any flour of choice to suit your needs. I’ve made them originally with whole wheat and now gluten free as well. Both are equally delicious! Don’t these look pretty? And they taste great too! Made with whole wheat pastry flour and sweetened with stevia, there is absolutely NO aftertaste. 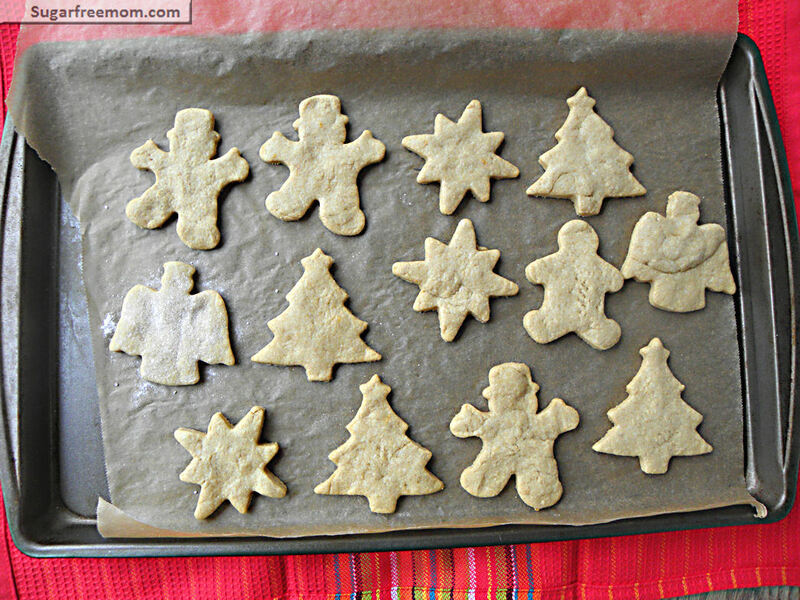 Easy to make cut out shapes with your kids and even frost if you like. Nice and flaky with a perfect amount of sweetness! If you’re used to the texture of a softer sugar cookie than these wouldn’t be the ones to make. Check my Whole Wheat Refined Sugar Free Cookies instead sweetened with sucanat which is still alot healthier and better for your family than white sugar any day. 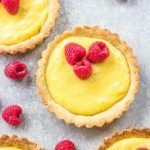 My VERY picky hubby who really doesn’t like many of ,my sugar free desserts and prefers all white flour and sugar products actually said these were good! That my friends is AMAZING! 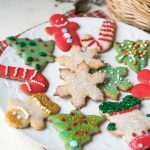 Either sugar cookie you choose everyone will enjoy them and you can feel good about serving them and eating them yourself! They certainly won’t hurt your calorie budget for the day as one of these is only 80 calories! 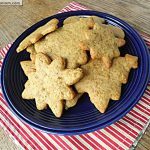 *To make this without stevia and refined sugar free, check this post: Whole Wheat Refined Sugar Free Sugar Cookies. Nutritional Information is using Bobs’ Red Mill All purpose Gluten free flour and does not include frosting on cookies. In a stand mixer combine butter, Swerve or powdered stevia, vanilla extract, vanilla stevia. Beat in eggs until well blended. Reduce mixer speed to low and gradually add flour. Using a tablespoon, roll into balls, flatten and bake 10 minutes on a parchment lined baking sheet. To make cut out shapes spread dough between two pieces of plastic wrap, roll to 1/4 inch thickness and use cookie cutters to shape. Bake on parchment lined baking sheet for 10 minutes. Once cooled add my Sugar-Free Buttercream frosting! Did you know I have a cookbook soon to be released on December 17, 2014. Right now you can pre-order on Amazon at a discount! I love my stevia. I love my cookies. Yup. I actually bought a whole bunch of it on sale and ended up hating it because it has this bitter after taste unlike Splenda so I no longer use it in my tea but I found that baking it into things like this makes it taste completely different so now I love it for baking. The daughter of a good friend of mine was just diagnosed with diabetes. I can’t wait to make these for her! Just ordered the powdered stevia :). Thanks for sharing! It’s best not to have sugar on Diabetes. I have diabetes… Do you have diabetes, Kaitlin? 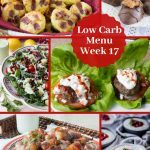 Sugar and high carbs are terrible for diabetics!!!! 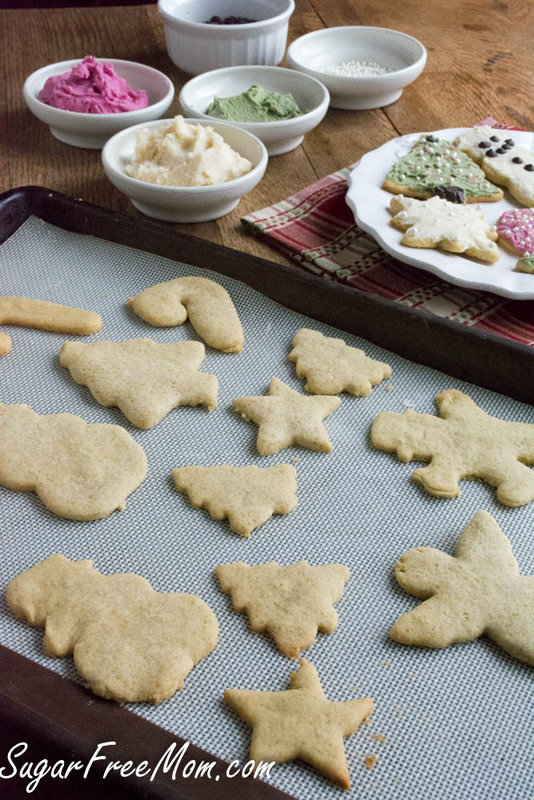 Do you have a good sugar-free icing recipe? So excited to make these for Santa with my daughter. I only have a cream cheese sugar free frosting on my dessert page, sorry. Your cookies are so cute and look super yummy. LOL my daughter made the cut out shapes! Thank you! 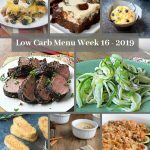 I’ve been trying to come up with a good lower sugar recipe. . .definitely will be trying these! Brenda, I noticed that you have something “sprinkled” on the cookies, which looks like sugar, but I am sure it isn’t. Could it be granulated erythritol? Actually, I think this would work because the erythritol keeps its “crunchy” texture longer than sugar. Just wondering….Thanks! Yes I didn’t use it on all of them but wanted a few to be sparkly! Well I could have tried to use less but I wasn’t going for less fat, my goal was no sugar. A stick equals approx 1/2 cup of butter. Here in Canada our butter comes in 450 gram blocks (approx 1 pound blocks) as well in 4 individually wrapped sticks. Each stick being 1/2 cup. Hope that helps! I was wondering if there was any way to make this without the liquid vanilla stevia? you could use plain stevia and add more vanilla extract or you could try without stevia and see if they come out sweet enough with just the powdered stevia. I need to work on the recipe for gluten free but that’s a good idea. 2nd-the cookies fell apart when baked and didn’t keep their form. They’d crumble instantly. What do u think I did wrong? Well I’m glad you liked the taste nonetheless. 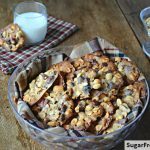 Did you change or sub any ingredients listed? I just made these, but they have a bitter after taste. After researching, I’m thinking to much stevia? Ok just made these however, instead of cutting them out and frosting them, I made them like snickerdoodles and rolled them into a ball and in a swerve cinnamon mixture. I didnt have pastry flour so used all purpose. I only had 1 stick of salted butter on hand, so used coconut oil for the other 1/2 cup of butter. This was my first time to use SWERVE. The dough tasted sweet and amazing. I was surprised that after baking for 10 mins, that they were dry and cakey. I was expecting greasy and crispy lol but instead had to rush down a cup of coffee so not to choke. Again, my first time to use Swerve but love the texture of the sweetener and weight. I guess Swerve still doesnt give the “liquid” consistency that real sugar does, but here’s the reality. We’re diabetics and MUST have sugar free recipes. This is a great cookie. And opens the door to many new recipes. I know it might be a challenge to get a sugar free match in taste and texture of the very real sugary world, but I think were on our way. THANK YOU for your recipe. I intend to study your recipes without guilt. Hi Brenda. I just want to make sure I understood it correctly. 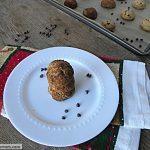 At first you have to make balls with tablespoon and bake them for 10 min. After that you have to put all the balls back together and roll the dough 1/4 inch thick and bake for another 10 min. Is that correct? Directions in #8 are only if you want to make the cut outs. You do not do both. #7 is just roll into balls and flatten cookies. I was skeptical, but was surprised, these are actually good! They are light and tasty. Went sugar free and gluten free for first time, and can’t wait to try more recipes now! Thanks for sharing! 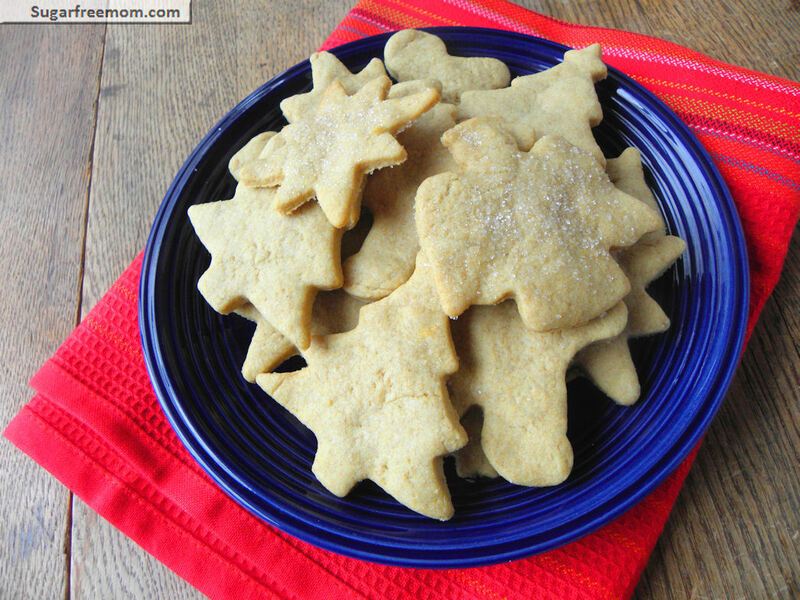 I made these with chickpea flour and swerve. I did 2 c chickpea flour with 1/2 c rice flour. Also, I did not have vanilla stevia so I used a bit of regular liquid stevia. I sprinkled Truvia on top of the cookies (I was too lazy to make frosting lol). The way I made them was good! 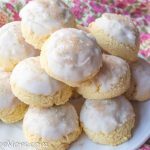 Not quite like classic sugar cookies but good in their own right. A smudge dry so I dunked in milk. 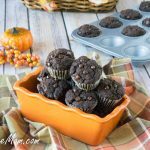 I made these gluten free and they turned out amazing! Other than that followed the recipe, refrigerated like 10 min while I cleaned dishes up. used ample flour on parchment paper to avoid sticking while cutting out shapes and everything worked great. Love these cookies! thanks so much for a great base recipe! 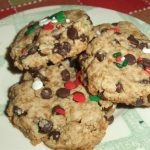 I made these cookies with stevia and they taste horrid! I love the texture and how they keep shape but they just don’t taste good, I added strawberry preserves on top to give them a better taste and it worked. I just wanted to inform others to probably use the swerve when they make these cookies because the stevia tastes horrible. Could be the stevia you used. My recipe includes both Swerve and only 1/2 tsp vanilla stevia. Oh, i used the powdered stevia and the vanilla stevia for the cookies. was I not supposed to? Which type of flour did you use. Eggs are enough of a binding agent to work in this recipe as you can see from my photos. I don’t like the chemical taste of Stevia so I used a half a cup of coconut sugar instead. YUM! Could try adding a little xanthan gum maybe 1/4 teaspoon. I always see yummy looking recipes but there will be something odd as an ingredient I’ve never heard of such as Liquid Vanilla Stevia. I ‘ve never seen that even in the store. And to go traipsing around in Brookshires or WF trying to find it is wayyy too much trouble. Try to keep to ingredients that most people have in their cupboards. Or give us a substitute.